"Management’s assessment of internal control over financial reporting was conducted using the criteria in Internal Control—Integrated Framework issued by the Committee of Sponsoring Organizations of the Treadway Commission, or COSO." COSO is dedicated to guiding executive management and governance entities toward the establishment of more effective, efficient, and ethical business operations on a global basis. It sponsors and disseminates frameworks and guidance based on in-depth research, analysis, and best practices as detailed from the COSO website. Comprising the professional associations listed below, the Committee of Sponsoring Organizations (COSO) is a voluntary private-sector organization. 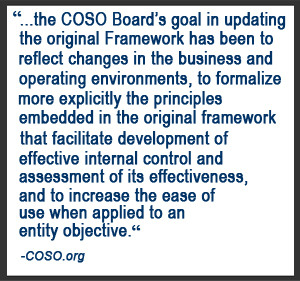 Learn more about COSO and its integrated framework for internal controls from the COSO website here. 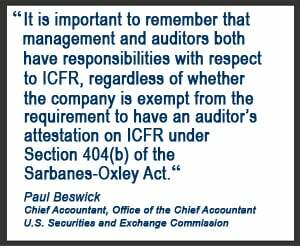 COSO 1992 Guidance has been used since the passage of the Sarbanes-Oxley Act of 2002. As of 12/15/2014, the new "COSO 2013 Guidance" will replace the 1992 version. Learn more about Vibato's COSO 2013 here. "We didn't have a dedicated budget to complete our SOX compliance but as a small public company that was going to be an accelerated filer by our next year-end, we knew we had to figure something out quickly that would allow us to comply with the full SOX 404 requirements. Vibato had a solution for us that cost less than $6,000, which was significantly less expensive than anything else we had seen in the market. I would recommend them to anyone looking for a cost-effective and scalable solution. "- Bob Ogden, CFO, Omni Bio Pharmaceutical, Inc.